With the help of shamefully fun shoddy sets and a talking snow leopard, Will Ferrell takes the Spanish-language telenovela from melodrama to wacky comedy in Casa de mi Padre. 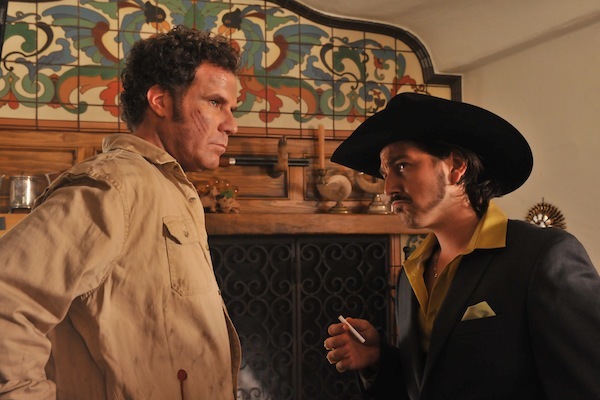 Will Ferrell stars in Casa de mi Padre, a concept comedy that plays a lot like one of Ferrell’s sketches from his nights at SNL. In the over-the-top style of a Spanish-language telenovela, Ferrell plays the dim-witted son of a Mexican rancher whose family becomes involved in the drug trade while he falls in love with his brother’s senorita (Genesis Rodriguez). With English subtitles, Ferrell plays Armando Alvarez totally straight, as if he were acting in a drama. The humor comes not from the dialogue, but the wacky pretense that this gringo has found himself in the alternate universe of a Mexican melodrama fueled by exaggerated emotions, golden guns, cocaine and oh, did I mention a talking stuffed leopard? The story in Casa de mi Padre is less important than the style, which ranges from satirical to goofy, all the way to a peyote-inspired hallucination. The film constantly makes fun of itself, including its attempt to look extremely low budget. The blatantly bad sets and backdrops appear to be stitched together from old cardboard boxes or recycled from other sets. Fake horses clop along smoothly, like they are rolling on wheels. As if unable to afford enough “extras” in the wedding scene, strategically placed mannequins fill the seats. One place they spent plenty of money however, was on the special effects for the gunshots. Fountains of blood spurt out of each victim like geysers. Adding to the wacky visual style is Gael Garcia Bernal‘s drug lord character, La Onza (which means snow leopard), whose alter ego is a mystical puppet that looks more like a rotting white tiger than any leopard I’ve seen. My favorite scene in the film is when the spirit of Ferrell’s Armando, who’s been shot and left for dead, convenes with the feline version of La Onza. In this near-death hallucination that looks a lot like a drug trip rife with ubiquitous Catholic imagery, the raggedy-Ann snow leopard resurrects Armando into a man of confidence, bravery and prowess. He’s now ready to go “mano e mano” with the drug cartel. Bottom line: You may need a couple tequila shots to get the most out of this kooky Will Ferrell comedy.